Brazilian cuisine is unique and Brazil recipes reflect the many different cultures that have shaped the country over the years. From the indigenous Amerindians to the colonising Portuguese and the African slaves they brought with them, each culture has added its own techniques and ingredients, with more recent arrivals such as Syrians, Lebanese and Japanese now making their own unmistakeable contributions. Like many Latin American cuisines, it can be maddeningly hard to get authentic Brazilian food in the UK, so here at the Real Brazil, we thought we’d provide you with some Brazil recipes for a slap-up authentic Brazilian meal, either so you can get ready for what's in store for you on your visit there, or to reminisce over some tasty memories once you've returned. Or why not invite your friends round and show them your favourite Brazil recipes. These Brazil recipes won't take long to prepare or cook and there aren't any ingredientes which you'll have huge difficulty sourcing from a decent supermarket, with the possible exception of the cachaça cane spirit for the caipirinha, and even this can be found in many larger supermarkets and specialist shops or online. 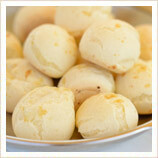 The delicious Pao de Queijo are Brazilian cheese dumplings made with tapioca flour. They’re puffy and chewy, like Japanese mocha, and perfect finger food, great for dipping! This Pao de Queijo recipe is really simple and will not take you long at all. Once made, the batter will keep in the fridge for up to a week so if you fancy some more, you'll have some at hand. This Pao de Queijo recipe is also great if you're on a gluten freediet as tapioca flour is gluten-free. Pre-heat the oven to 200°c and grease a cupcake tray. Put all the ingredients in a blender and pulse until smooth to create your batter. This recipe is quite simple so feel free to experiment by adding herbs and spices to the mix. Pour the batter evenly into the cupcake tray and then bake in the oven for 15-20 mins until the batter has puffed up and they are slightly brown on top. Leave them to cool. Enjoy! 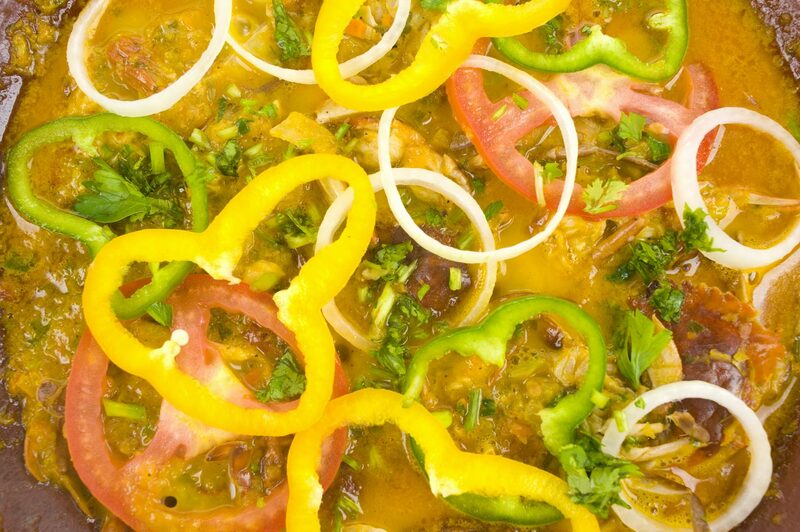 Originating in the south-east of Brazil, Moqueca Capixaba is a flavoursome fish stew made with lots of vegetables, spiced well and garnished with fresh coriander. Moqueca Capixaba can be found all over Brazil but the recipe here is for the north-eastern Moqueca Bahiana variation, made with coconut milk and using white fish. Serve this Brazilian recipe with boiled rice and/or crusty bread. 650-900g of fillets of firm white fish such as halibut, swordfish, or cod, rinsed in cold water, pin bones removed, cut into large portions. Place the fish into a bowl with the minced garlic and lime juice, making sure all the fish is coated. Sprinkle liberally with salt and pepper. The lime juice will begin to cook the fish and really infuse it with flavour. Coat the bottom of a large covered saucepan with olive oil and place on a medium heat. Add the chopped onion and cook for a few minutes until softened, do not brown them. Add the bell pepper, paprika, chilli flakes and liberally season with salt and pepper. Cook for a few minutes longer and once the peppers begin to soften, add the chopped tomatoes and onion greens and simmer for five minutes uncovered. Stir in the chopped coriander. Remove half the vegetables (but don’t throw them away!) and arrange the vegetables left in the pan into a bed and place the fish onto them. Season with more salt a pepper. Place the half of the vegetables you removed back on top of the fish and cover everything with coconut milk. Bring the stew to a simmer and cook it this way for 15 minutes with the lid on. Taste and adjust the seasonings as to your liking. Finish it with a garnish of coriander and, if you want to be authentic, serve in a clay pot. 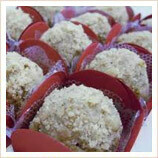 Docinhos (sweets) are a great informal and sociable way to end your Brazilian meal. This is also a really nice easy recipe! In Brazil, these sweet, truffle-like treats are often eaten at weddings, birthdays and other special occasions but we reckon that they suit every occasion. We thought we’d provide you with a quick Brazil recipe so you can lay on a platter of docinhos to end your Brazilian feast. In a saucepan, mix the chocolate powder, nuts, condensed milk and butter on a low heat. Stir constantly until the mixture has become transluscent and then keep stirring for a couple of minutes. Pour the mixture onto a plate and let it cool fully before handling. It's best to leave it in a cupboard over night. When cooled, butter your fingers and form little balls out of the mixture. Garnish with roughly chopped walnuts. This classic Brazilian cocktail is made from Brazil’s national liquor, Cachaça, and no Brazilian dinner party is complete without it. Cachaça is made from sugar cane which is distilled in oak or indigenous-wood barrels for one to twelve years. Fans of the drink believe it will rival the most coveted whiskies and cognacs one day. However, it could do with a bit more exposure before it really takes off and this would seem unlikely anytime soon as, like the Danes, the Brazilians hate to see it leave, with only 1% of the yearly production of 2 billion litres of the stuff ever leaving Brazil. 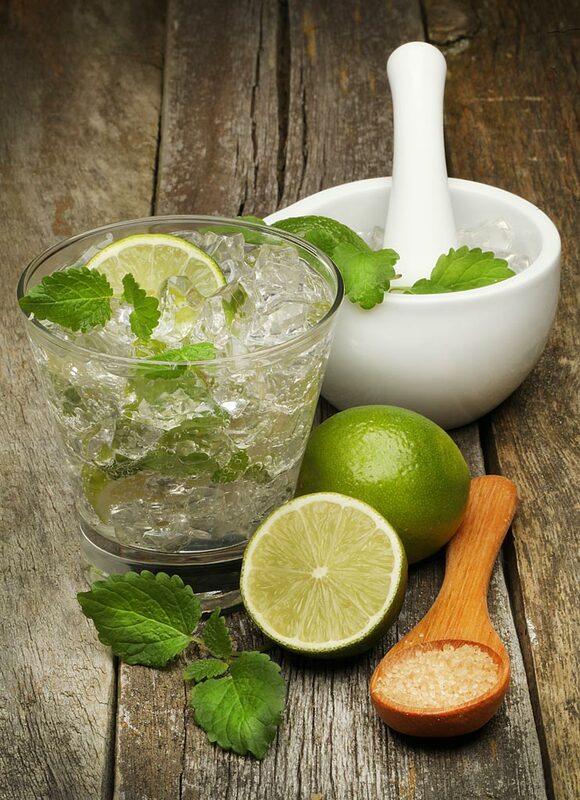 Place the lime wedges into a pestle and mortar with the sugar and grind together to release the juices from the lime. Pour the contents of the mortar into a cocktail shaker along with the Cachaça and crushed ice. Shake and serve.